What follows is a collection of Questions and Answers to help you become acquainted with RTUC. How does someone become a member of Redford Township Unicycle Club? Most of the time, our new members come from our beginning unicycling class, but not always. We have many members who come to us already knowing how to ride, or become interested through a friend. Because we only offer the beginning class once a year, if you miss the session you may become a member during other times of the year if you are willing to purchase your own unicycle and learn on your own. The cost to join RTUC is only $20 annually for an individual/$35.00 annually for families. 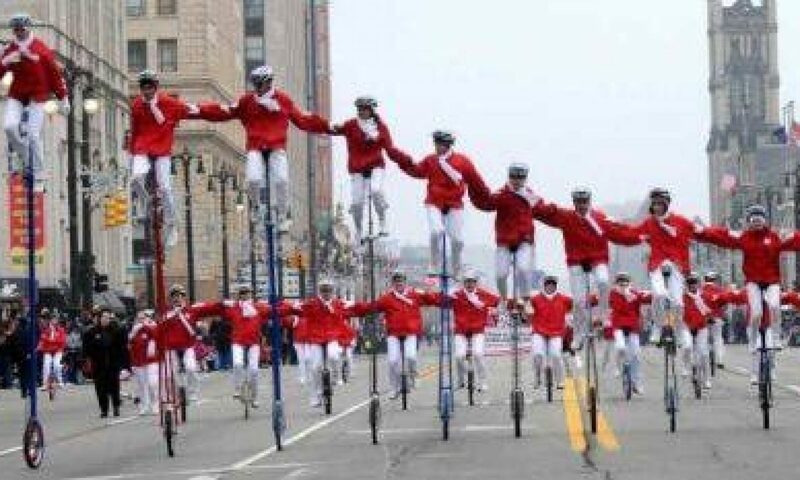 RTUC members are also required to become and stay current members of the Unicycling Society of America. USA membership is $20 for an individual or $35 for a family and includes liability insurance for members. USA now offers free membership for children in a free/reduced school lunch program. What does being an “active member” mean? To be considered an active member of RTUC you are asked to attend an average of one Saturday practice per month and two money making parades or performances per year. Your RTUC membership fees for the calendar year must be paid up and your USA membership must also be up to date. If you are unable to be an “active member” during a calendar year, your RTUC renewal for the next calendar year might be $10.00 more for the next year. Do I have to attend the practice right before an event to be able to participate? Generally, no. If we haven’t seen you for a while and you can suddenly attend a parade, please come. On-line signups are sent out via email but extra people are always welcome even if you haven’t had a chance to previously commit yourself. If you plan to participate in a performance it is more essential that you attend the preceding practices to learn routines. Watch for e-mail notices about this or announcements on our web site. Joining doesn’t cost much, how does the club make money to support itself? The donations we receive from participating in parades and performances pays the rent for our practice facilities, some uniform costs, insurance, refreshments at parades, maintenance and purchase of club owned unicycles and equipment, costuming costs for NAUCC (North American Unicycling Convention and Championships) plus many other things. Your attendance at these events is very important to the existence of our club. What happens at regular Saturday morning club practices? Saturdays practices are a mixture of activities and frequently change from week to week depending upon our upcoming schedule. Activities may include individual skill building, large and small group riding practice, skill building games, unicycle hockey, parade formation practice, performance rehearsals, level testing and riding exhibitions. Practices always include planning meetings and snacks. Are there other practice and/or unicycling opportunities besides Saturday mornings? Optional weeknight practice has been held September to May when a gym is available. Gym fees for these unstructured practices are paid by RTUC with proceeds from money making events in which active members have participated. Weekday evenings in the summer are usually park rides or NAUCC (National Convention) practice. Groups of riders may also meed for Unicycle Basketball Muni, or mountain unicycling (rough terrain). Let us know if you’d like info or check the Web Calendar linked to our Events page. To participate in club activities: parades and performances, what do I wear? New riders and walkers wear the same thing; royal blue club t-shirt, white pants, white socks, ALL white shoes and a standard RTUC issue bike helmet. This is also the combination worn by everyone for outdoor club performances. For cold or damp weather you also need a red windbreaker, no hoods, please. When a rider obtains enough skill to join the parade formation, a new formation uniform is needed. This consists of a blue and white shirt and blue shorts (along with white socks, shoes and helmet). The deposit for the uniform shirt is $25, which is half its cost, and a portion of that may be refunded if the rider returns it in good condition when he or she leaves RTUC. See complete guidelines on the Uniform page. Other uniform combinations or attire may be needed for special occasions. What does a new rider do during a parade? New riders are important to our parade unit. They are the ones that the spectators will identify with most and cheer for as they remount and show new skills learned. These non-formation riders usually ride separately from the formal formation in small groups with the occasional help of a walker. Often space is tight so new riders must pay close attention not to get in the way of the tall giraffe unicycles or collide with the crowd. See the Parade Protocol on the Member Resources page for more information. What does a walker do during a parade besides the obvious: walking? Walkers are essential in every parade to help beginning riders and giraffe riders remount, provide water to riders throughout the parade, carry the club sign and pass out literature about RTUC to parade spectators. Beginning riders who do not feel that they have enough skill or endurance yet to ride in parades may also fulfill their participation requirements by helping this way. Somebody handed me paper Uni-money at a parade, what is that for? Uni-money is our small way of rewarding you for your participation. It is good for one year from the date of issue and is non-transferable. Because it is a reward for participation, the person who earned it (did the participating) is the only one who may use it. It is good for anything that you might give the club money for: t-shirts, RTUC dues, patches for your jacket, uniform items, gym fees, etc. Uni-money earned at a parade or performance is worth $2 each. You may also get reimbursement from our treasurer for other unicycling related expenses such as new equipment or registration fees. See the reimbursement form on the Member Resources page for details and make sure to include receipts or other proof of your expense. I’m really excited about my new passion, unicycling, and would love the world to know. Can I get more unicycling t-shirts and stuff besides the blue club shirt? We also have some stock of designs that were printed in the recent past. Contact Kathy Susanka if you’d like to know what’s available. You can find some other shirts at Unicycle.com. We also have unicycle embroidery designs that is available to RTUC members only. You can have this design, black or silver stitching, as well as one that includes our name, and the one that is featured on our van signs, stitched onto just about anything, even a garment that you already have; polo shirt, hat, jacket, tote bag, pillow case, socks, etc. Initial Artistry in Dearborn Heights, Ford Rd just east of Beech Daly is our embroiderer of choice, drop by and see Rufus with your requests. I’d love to ride one of those tall unicycles, can I borrow one? RTUC owns several giraffe unicycles, 4, 5 and 6 foot, along with lots of interesting pieces of equipment like the balance beam and some specialty unicycles. If you’d like to borrow one to take home and practice on or with, talk to our equipment manager, about bringing it to practice. We do reserve the right to restrict the borrowing of equipment based on riding ability and equipment capacity. I’ve noticed lots of people in RTUC doing different jobs, how can I help? All of RTUC’s officers are volunteers. Some are elected and some have just raised their hands and said, “I’ll do that!” If you’d like to help, there are plenty of opportunities. If you see something that needs doing or a way you think you can contribute, you are more than welcome. Refreshments at practice are a good way to start, look for the sign up sheet on the refreshment table if you’d like to contribute something. Each year, usually in November, we have an annual business meeting and potluck. The annual election of officers as well as reassignment of other positions and jobs takes place at this event.